Join the Staff Development Coalition! Join the Staff Development Coalition and receive discounts on professional and leadership development training. 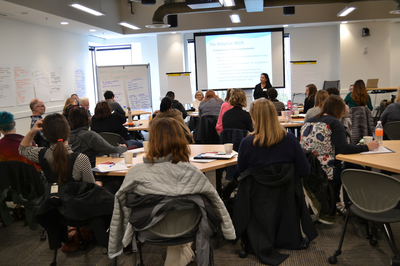 These workshops help nonprofit staff and leaders reach professional and personal excellence through thought-provoking training workshops led by national and regional trainers/experts. You can improve how staff members work with each other and with the communities they serve. Each session is 3-6 hours long and provides affordable staff and leadership development on topics such as staff retention, diversity and inclusion, cultivating empathy and emotional intelligence, building leadership skills, improving communication, and handling difficult conversations. These topics are suggested and approved by the committee members and are especially important for nonprofits that serve diverse and vulnerable populations. Sessions cost is $100 per person for SDC members that bring 1-5 attendees, $90 that bring 6 or more attendees. Non-members pay $149 per attendee. Learn more about becoming a member by contacting Kendra B. Demuth, kendra@501commons.org, Program Manager of HR Consulting, Organization & Leadership Development. Learn more about the History and Accomplishments of the Staff Development Coalition. Wednesday, May 15, 9:00 a.m. to 4:30 p.m. This workshop provides an opportunity for participants to explore different ways a conversation about race and diversity would be successful. It is designed to heighten your awareness, become comfortable in engaging in intersectional dialogue and utilize the understanding obtained to expand beyond cultural competency to the action. We will share best practices, facilitation principles, applied behavioral theories that help with “holding the container” for these sometimes-messy conversations. This session is perfect for people managers, change agents, people participating on their organizations’ equity committee. Participants leave this training with the skills and tools needed to facilitate constructive diversity dialogues. Registration for these workshops is hosted on Eventbrite. If you need help, here are the step-by-step instructions for registration. For more information about becoming a member, please contact Pragya Madan at pragya@501commons.org.